Pit bulls invade homes, work spaces, cars and yards protected by privacy fences or walls for one sole reason: to attack with no warning and no provocation. This kind of extreme attack is almost unheard of among other kinds of dogs because it is, obviously, not normal pet dog behavior. This behavior puts people and pets in danger in their homes, workplaces, yards and inside their cars, trucks or vans. This list is by no means complete and will be updated as more reports of pit bulls invading people's private spaces to attack occur and are found. 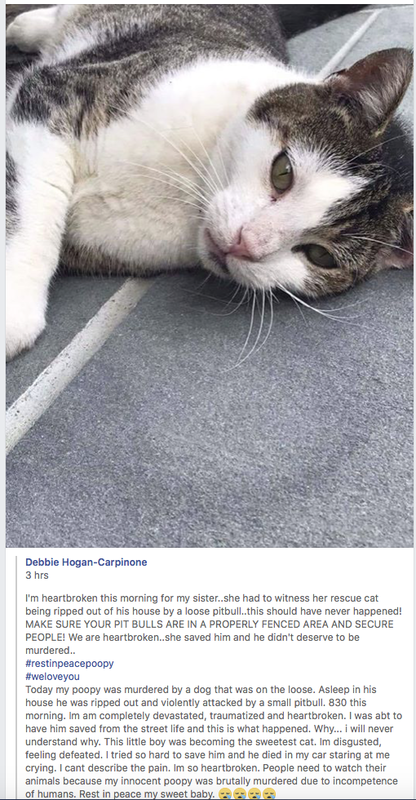 2018 NY - A pit bull invaded a home and killed a rescue cat. 2018 FL - A pit bull tore open a window screen and then wriggled through a partially open window in order to get inside a home to kill a cat. 2017 NC - A pit bull dashed into a home when the owner opened the door to shoo the pit bull away. The owner describes how the pit bull immediately began searching for her cats to attack them. The pit bull followed the three cats who escaped outside through an open window and killed one of them in front of the horrified owner and neighborhood children. In addition, local authorities are breaking their own laws by not following up and making an incident report. 2017 MA - A pit bull invaded a woman's apartment and immediately killed her cat. The apartment complex had a ban on pit bulls so the entitled pit bull owner lied, saying the pit bull was an emotional support dog so the manager had to allow it to stay. If the pit bull owner had not decided the law doesn't apply to her, Gem the cat would be alive today. 2017 OH - A woman ran to a police station after a man fired a weapon in the direction of a group of people she was walking with. When she went inside the police station, a stray pit bull chased her inside and attacked police officers who shot the pit bull. It was later euthanized. 2017 AU - In another unfathomably horrendous attack, a loose pit bull invaded a house and fatally mauled a shih tzu mix named Thor. Thor whas his owner's PTSD health assistance dog. Thor's owner's son stabbed the pit bull to death. The family has been horribly traumatized. Normal pets do not do this. “(My son) Tyson was so traumatised that he couldn’t even talk. The ambos sat with him for quite a while. I was so distraught they took me to the hospital,” she said." 2017 PA - A pit bull escaped its fence then happened upon a mini-van parked behind a house. The van was open with two children strapped into their car seats. The pit bull invaded the mini van and seriously mauled the two helpless children who are strapped into the van! Both children are hospitalized in serious condition. This kind of horrific attack is only committed by pit bulls. Normal pet dogs NEVER do this kind of completely unprovoked, gruesome attack. 2017 UT - Pit bulls must be banned from the apartment complex where this invasion attack happened because the news reported that a boxer invaded an apartment and attacked a black lab and its owner. However, there is video which clearly shows that a pit bull invaded an apartment and attacked another pit bull. 2017 CA - Pit bulls invaded the backyard of a 3-year-old miniature poodle named Precious and killed her right in front of the owner. Since Los Angeles animal control didn't know if animals that kill for fun when loose should be put down, the owner released their security camera video of the gruesome, completely unprovoked and unrelenting attack in the hope that animal control would have common sense and decide the pit bulls must be put down. 2017 - Show dog and best friend to a young girl was mauled by pit bulls that invaded the fox terrier's indoor/outdoor run. 2017 IL - An elderly owner let her beagle mix out into their fenced backyard. While the owner was standing right there, a 6 pit bulls jumped the fence into their yard and killed her beagle. The owners, an elderly couple, are devastated. 2017 WA - A pit bull entered into a fenced back yard and killed Princess, a family's chihuahua. The Humane Society for Southwest Washington could not find the owner and believed euthanizing the extremely dog-aggressive pit bull was the correct thing to do. But, lawyer Adam Karp intevened, threatening a lawsuit. Karp won possession of the pit bull and moved the pit bull out of the state of Washington. 2016 AR - Three dogs, two of which are pit bulls, pulled down a slat of a wood privacy fence when they tried to climb over the fence into the neighbor's yard. One of the neighbor's dogs, elderly and blind, got near the hole, and the pit bulls grabbed the victim's face and tore the dog through the small gap, tearing the dog's face off in the process. 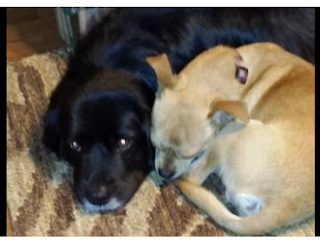 When a second, small dog went to protect his buddy, the pit bulls killed him. Then the pit bulls entered the neighbor's yard, went through the doggie door and killed the neighbor's third dog. All three invading maulers were inside when the family came home to a gruesome blood soaked scene in their home. 2016 FL - The owner of two dogs came home to find both of them torn apart, one, a Chihuahua named Buck, in the yard and one, a border collie mix named Boots, in his own bathroom, by two pit bulls that jumped a fence and invaded a yard and then entered the home through the doggie door. One pit bull was still in the home and growled at him from the bathroom. After police came and removed the growling pit bull, the owner discovered that Boots had been completely torn apart and was in the bathtub. The pit bulls had already been declared dangerous for attacking another dog, but were given back to the owner. 2016 NY - Three pit bulls jumped a fence and invaded a yard and killed two chihuahuas in their own yard while the chihuahuas' pregnant owner was out in the yard with them. She tried to save all her chihuahuas but two of her beloved pets, Bentley and Remy, were killed. The chihuahua owners say that the owner of the pit bulls has more pit bulls at his home and they are too upset to live in their own home. 2016 NV - A German shepherd was torn apart in his own yard by two pit bulls that sailed over a 5 foot fence like it was nothing. 2016 PA - A 9 year old girl was scalped when another person opened the door to her home and a stray pit bull rushed in and attacked her. The family's own pit bull attacked the stray pit bull, and an adult had to get them separated, and then the stray pit bull ran away. No one has seen or found the stray pit bull, and police visited the homes of neighbors with pit bulls. 2016 GA - A 69-year-old woman was severely mauled inside her own home when two pit bulls busted through a door to her home and attacked her. She had to drag herself from the kitchen to an office, where she barricaded herself off and called for help. She was very seriously injured. The pit bulls and their owners were found to be living in squalor and the pit bull owners are facing charges. The owners said they had attempted to save what they believed to be fighting pit bulls. 2016 TX - Pit bulls repeatedly invaded a family's yard and eventually killed all of their seven chihuahuas. 2016 IN - Two dogs, a pit bull and a St. Bernard, escaped their home, traveled six miles, and busted through a screen door and attacked a dog. The owner, her son and the injured dog had to hide in their basement until the invading maulers decided to leave. As far as AC is concerned, after a short quarantine, these two maulers are good to go home. 2016 PA - Two pit bulls invaded a home through an open window for the express purpose of killing a lab inside the home. They dragged the lab outside, and the lab's owner shot them to stop the attack, killing one. 2016 UK - An illegal pit bull entered a pensioner's home and attacked him biting his thumb off. 2016 MO - The mayor of Florissant MO stated that his city need to be able to keep their ban. He related that a boy had been recently attacked by an illegal pit bull that dug under a fence to get to a boy and attack him. 2016 NY - A pit bull charged to the back yard of a home, barged through a fence and chased Missy, a Chinese Crested, into her own home and attacked her. A teenager came running in with another pit bull and both pit bulls tore Missy apart in her owner's living room. The owners had never heard the death scream of a terrified dog being torn apart before, and are horrified by it. One of the owners always thought that pit bulls got a bad rap, and now she knows they deserve it. One of the news outlets reporting on the story was cowardly and unethical and withheld vital information about the breed of mauling dogs. 2016 ON - An illegal pit bull that had been recently adopted escaped its owner's condo and pushed through the front door of a neighbors condo and killed the neighbor's dog in a bloody, vicious, horrific invasion attack. The owner said he could tell his April was already dead in seconds because the pit bull had literally ripped April completely open. One of the neighbors was scratched trying to keep the invading pit from attacking their other dog. (this attack is also posted in attacks by recently rescued dogs). 2016 NM - A pit bull invaded a yard and attacked a dog named Susie. The owner was injured while stopping the attack. Susie was severely mauled and traumatized. The pit bull owner was issued a citation. 2016 AL - An unknown, stray pit bull entered a 13 year-old boy's yard and mauled him. His parents and neighbors used board to beat the dog off the boy. By the time the rescuers got the pit bull off the boy, he was unconscious. The pit bull was still at large. When the local news outlet called AC to report the dangerous dog, they got no response. The boy was immediately taken to surgery. 2015 BC - Horrendous Christmas day invasion attack. Two pit bulls rushed into a couple's home and ripped apart their cat. Then the pit bull began attacking the couple. Both the man and woman had to be hospitalized and the man has had 4 surgeries on his arms so far, and he may lose both arms. 2015 OH - A pit bull attacked an elderly woman's caregiver outside her home. When the 84 year old woman opened her door to help her caregiver, the pit bull invaded the house, attacked the elderly woman and killed her 2 year old pekingese. The women are traumatized. The pit bull owner gets to keep her disgusting mauler in the neighborhood even though it is known that if it gets loose, it will seek to kill people and pets. Ohio clearly values killer dogs and their owners over children, pets and the elderly. 2015 AU - Just as an owner of four Shih tzu maltese poodle mixes was shutting the main door of his house, the two dogs busted through his closed screen door and attacked his dogs. A pit mix and a bull mastiff "played tug-of-war" with one of his dogs. “There was blood everywhere. There was actually flesh on the wall. It was horrible,” she said. Rastus, the dog, survived but will never be the same. 2015 AB - Angel, an Australian shepherd, was attacked in her own backyard, with the carnage continuing into the family’s home. She was later euthanized due to her injuries. It took six adults beating the pit bull with rolling pins and shovels to get the pit bull to release. It attacked three times and continued to attack after it was mortally wounded. The community is calling for a pit bull ban. 2015 NJ - Pit bulls broke through a fence to attack two english bulldogs. Despite the owner and children beating on the pit bulls, they dragged one of the English bulldogs into their yard. The owner was afraid to try to retrieve their bulldog who was savaged by an extended attack. He was left for dead when police and AC got there, but when he moved his head, his family was allowed in the yard to retrieve him. They took him to the vet and spent thousands of dollars on surgery, but he could not be saved. 2015 AL - A loose pit bull jumped a 6-foot privacy fence into a protected yard for the express purpose of mauling a 9-year-old boy. The beast was shot twice and beaten with a bat to get it to stop the attack. The boy is expected to survive. 2015 WY - Two pit bulls attacked and seriously injured dogs in their own yard in the 2500 block of East Monroe. The pit bulls were cornered and locked up and were taken to the PAWS for Life shelter. The injured dogs were taken to a veterinarian for treatment of multiple puncture wounds. 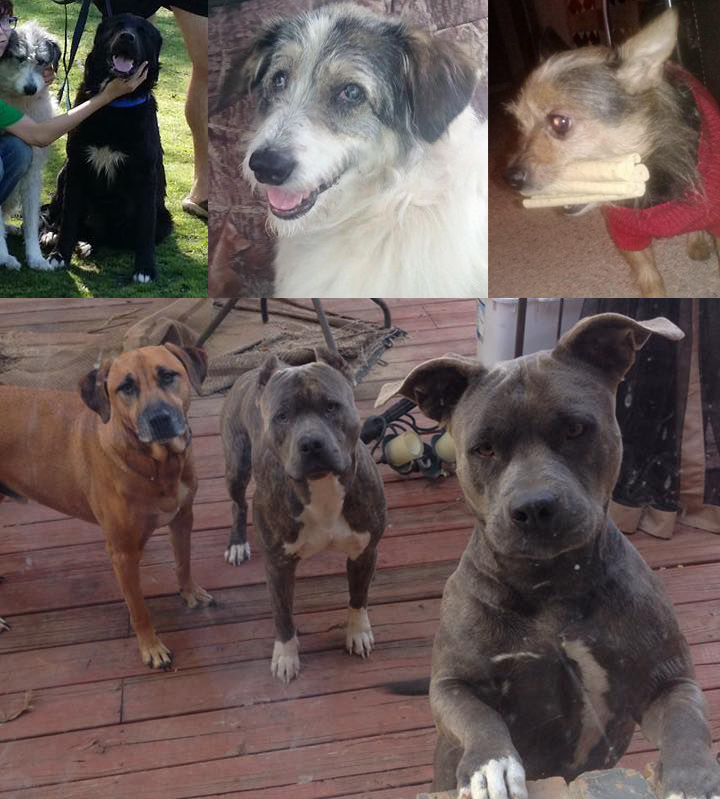 The owners of the pit bulls were allegedly incarcerated last week. It is not known if anyone was caring for the pit bulls. The Riverton Police Department assisted Deputies with the case. 2015 OH - An elderly dog was seriously mauled by pit bulls that broke into the victim dog's fenced yard. And then the pit bulls were given back to the owner/neighbor. 2015 PA - A tiny pomeranian was killed in his own yard when a pit bull pushed open the gate of of the pom's yard and found a way into the neighbor's fenced in yard for the express purpose of killing the little dog. 2015 - Precious, the darling in the pink collar, did not survive a brutal mauling by her neighbor's two pit bulls. The grieving owner writes, "one of the pits tore a hole in our galvanized fence and grabbed our little dog and tore her apart from head to toe." Precious had soft wavy hair and had survived a battle with meningitis a few years earlier. " 2015 GA - Two owned pit bulls got loose, somehow entered a fenced yard for the express purposed of killing a 14 year old miniature poodle. 2015 CO - At about 1:20 AM, three pit bulls got through a privacy fence into a backyard, and then entered the garage through a doggie door for the express purpose of attacking a German Shepherd inside the garage. 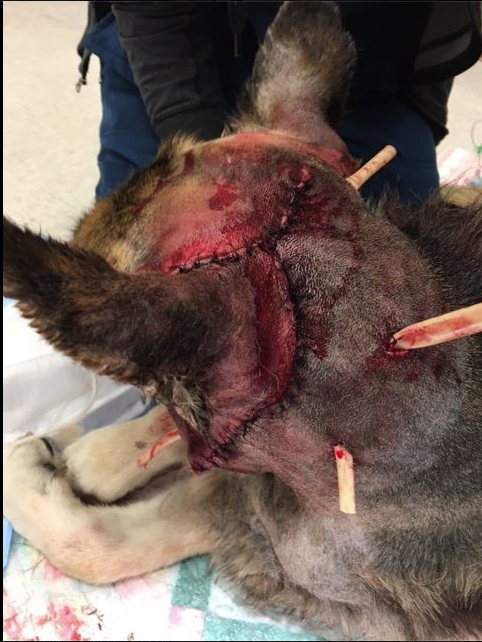 The German Shepherd owner shot the three pit bulls to stop the attack. This is the third invasion pit bull attack reported in 2 days in the US. 2015 FL Two pit bulls escaped their home and leaped through a window into a neighbor's home and killed the neighbor's pit bulls and attacked pet birds. This attack was reported one day after the previous Florida fatal pit bull home invasion attack was reported below. 2015 FL Two loose pit bulls jump over a baby gate on a man's front door and enter his house in order to kill the two dachshunds sleeping on their doggie beds inside the home. The man, who was confined to a motorized wheelchair, heard the horrible death screams of his pets, left the wheel chair and crawled on the floor in a desperate attempt to save his dogs. One of his dogs died. 2015 AR - A pit bull scaled a 6 ft. privacy fence for the express purpose of killing a Jack Russell terrier in his own yard. 2015 FL - Pit bulls busted through a privacy fence for the express purpose of killing two yorkies. They also attacked the yorkies' owner who was trying to save her little dogs. 2014 IL - A pair of pit bulls probably killed 11 pets in multiple attacks at different addresses, all of which were found mauled and dead on their own property including 3 chihuahuas that were killed inside their home (locked except for a doggie door) while their owner was away. The chihuahua owner developed PTSD after seeing the carnage inside her own home upon her return. 2014 SC - A pit bull entered a woman's yard and attacked her small dog, and she fired shots from her gun at the pit bull. The pit bull came toward her, and she was able to keep it away with a chair. The pit bull then ran into the home through a doggy door. The woman said she then shot and killed the dog because she feared for her safety. The woman asked deputies to help put her dog out of its misery. The officers also buried the pet. 2014 OK - Loose pit bull saw a dachshund through a glass window looking out. The pit bull crashed through the glass window into the home for the express purpose of attacking the little dog. The doxie owner was bitten on the foot while trying to get the pit bull off her dog. Her home was full of broken glass and blood. 2014 - A loose pit bull rushed into a woman's home to attack her chihuahua. The woman stabbed the pit bull. The attack did not make it to the news. 2013 MD - Two pit bulls charged into home and killed a pet cat inside. 2013 PA - Pit bulls invaded a home, attacked a dog, left and continued around the lake to attack people and pets in 1 or 2 more separate attacks. 2013 CA - Letter to the editor from woman whose cat was attacked by two pit bulls entering her home and lamenting that no one is taking this problem seriously or doing anything about it. 2013 WI - A pit bull barged through door to attack small dog. The victim survived. 2013 FL - A pit bull invaded home trying to kill cat. Homeowner had to stab the pit bull to death. 2013 MA - A pit bull enters home and attacks two dogs. 2013 PA - A rottweiler attacked woman and her little boy on street and then continued the attack after chasing them into their home. 2012 IL - A pit bull pulled American Eskimo Dog out of his own fenced yard through the bottom of the fence, breaking his neck in the process. 2012 CA - A pit bull entered home to attack corgi. Police shot the pit bull. 2012 IL - A pit bull entered a garage to kill a pet dog. When the owner intervened he was seriously injured. 2011 WA - Sue Gormon was granted $2.2 million in la awsuit against the county and the pit bull owners after two pit bulls entered her home at night and attacked her while she was sleeping in her bed and then killed a dog she was caring for. 2011 MT - Pit bulls entered home and killed 5 cats. Walking in on the scene caused the owner to develop PTSD. 2011 ON - A pit bull invaded home on Christmas day and killed a poodle in front of boy with Asperger's syndrome. 2011 LA - A pit bull sets off security alarm pushing its way into home to attack a small terrier mix. 2011 UK - Pit bulls invade enclosed yard, then invade home, then tear apart a crate to get to the family dog to kill her. All the while a mother and two children, barricaded in a bedroom, hear the screams of their pet. 2008 NC - A pit bull ran into blind woman's home and killed her dog. Another woman stabbed the pit bull to death. 2007 IL - Pit bulls invaded a home to kill a pet cat in front of children. 2007 IL - A pit bull attacked a man and followed him into his home to continue the attack. 2006 IN - A pit bull escaped its house, ran into another house, and a brave little pomeranian jumped between the intruder and a 3-month-old infant that was lying on the floor. The hero pomeranian was killed. Animal Control and Education Commission voted unanimously that the pit bull mix was not vicious. Someone should buy the commission a dictionary and some common sense. 1991 IL - A pit bull invaded a home to attack a Great Dane. 1912 IL - A pit bull invaded a school and attacked three girls all under the age of 12.